Brighton Music Conference (BMC19) has announced its programme of panel discussions, talks and seminars from across the music, nightlife, tech and digital industries, together with tech masterclasses, evening networking events and its nighttime party schedule for the 6th Edition, held at the British Airways i360 beachfront centre and i360 Pod observation tower and various venues in Brighton from Wednesday 24th – Saturday 27th April. Brighton Music Conference (BMC19) has announced its programme of panel discussions, talks and seminars from across the music, nightlife, tech and digital industries, together with tech masterclasses, evening networking events and its nighttime party schedule for the 6th Edition, held at the British Airways i360 beachfront centre and i360 Pod observation tower and various venues in Brighton from Wednesday 24th – Saturday 27th April.BMC HighlightsBMC19 features 2 BMC Professional Conference Theatres, Pioneer DJ Academy Theatre, Focusrite/Novation theatre, and the official tech exhibition and music services Demo Zone. Highlights announced from this year’s programme include a BIMM sponsored ‘2nd Summer of Love’ discussion with Paul Oakenfold interviewed by Alon Schulman from Universe, as well as DJ Growth Lab’s ‘Meet The Mentors’ session and label Q+As with Defected, Ultra Records and 15 years of Shogun Audio. This year’s A&R panel will be moderated by Stuart Knight from Toolroom and there is an interview with Shadow Child. There will also be a ‘Sound healing’ workshop with Tom Middleton and Tony Andrews (Funktion One). Pioneer are hosting workshops this year in the Academy Theatre, where leading electronic music DSP, Beatport, will deliver its Annual Report as well as taking part in a Beatport brand Q&A. The event will also host Toolroom Academy workshops and BMC’s The Label Lounge, where producers can book meetings with labels. BBC Radio 1 Newsbeat will broadcast live from the i360 pod on Friday 26th April. BMC19 features 2 BMC Professional Conference Theatres, Pioneer DJ Academy Theatre, Focusrite/Novation theatre, and the official tech exhibition and music services Demo Zone. Highlights announced from this year’s programme include a BIMM sponsored ‘2nd Summer of Love’ discussion with Paul Oakenfold interviewed by Alon Schulman from Universe, as well as DJ Growth Lab’s ‘Meet The Mentors’ session and label Q+As with Defected, Ultra Records and 15 years of Shogun Audio. This year’s A&R panel will be moderated by Stuart Knight from Toolroom and there is an interview with Shadow Child. There will also be a ‘Sound healing’ workshop with Tom Middleton and Tony Andrews (Funktion One). Pioneer are hosting workshops this year in the Academy Theatre, where leading electronic music DSP, Beatport, will deliver its Annual Report as well as taking part in a Beatport brand Q&A. The event will also host Toolroom Academy workshops and BMC’s The Label Lounge, where producers can book meetings with labels. BBC Radio 1 Newsbeat will broadcast live from the i360 pod on Friday 26th April. 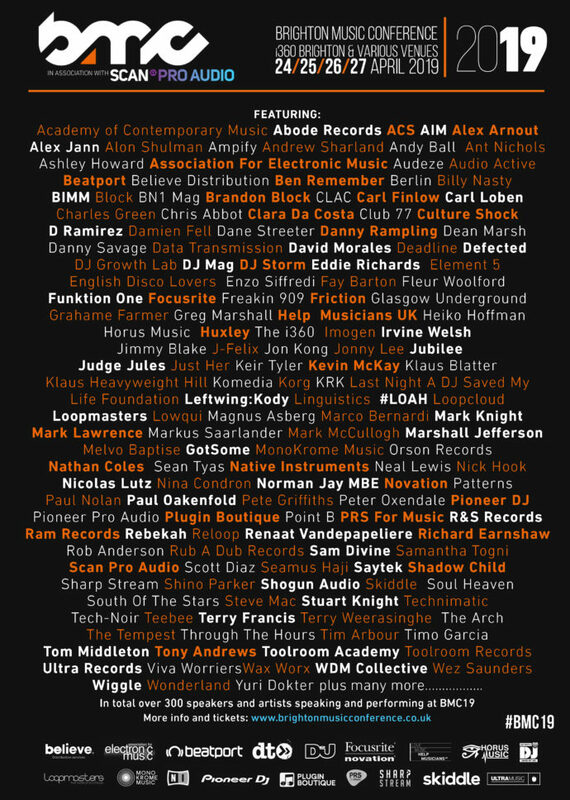 This year’s programmes include ‘Getting paid when DJs play your music’, ‘Is Greed Killing the dancefloor’ and ‘Maintaining Mental Health in the electronic music industry’.Over 200 speakers confirmed including David Morales (key note talk), Paul Oakenfold, Irvine Welsh, Marshall Jefferson, Danny Rampling, Huxley, Norman Jay MBE, Friction, DJ Storm, Teebee, Leftwing & Kody, Kevin McKay, Carl Finlow, Tom Middleton, Brandon Block, Rebekah, and Jubilee, joined by representatives announced from Scan Pro Audio, BBC Radio 1, PRS for Music, BIMM, AFEM, Defected, Ultra Music, Glasgow Underground, R&S Records, Glitterbox and Toolroom, Beatport, DJ Growth Lab, Believe Distribution, Focusrite Novation, Help Musicians UK, Loopmasters, Hospital Records, Pioneer DJ, Sharp Stream, Skiddle, and Horus Music, LNADJ and many more.BMC’s sixth year also features a specialised DJ and music tech and service providers exhibition zone. Focusrite/Novation will host their own demonstration theatre with talks and workshops with Rebekah and Alex Arnout and more. No separate ticket required.Toolroom AcademyBMC will host Toolroom Academy with 5 production workshops and talks on Thursday 26th April at nearby The Arch, as well as demo drop-ins. New for 2019 is BMC’s The Label Lounge, in association with AIM, comprising A&R feedback sessions, at The Tempest Inn on Friday 26th April. Labels represented include Skint, Cr2, Glasgow Underground, Champion, Sola, Axtone, Solotok, Audio Rehab, Realm, &Friends, Basement Sounds, Wired, Daylight Robbery, Shanghaied and more to be announced. Networking events include AFEM presents BMC opening, Women In Dance Music & Native Instruments in i360 Pod;Data Transmission & Shanghaied; Novation/Help Musicians UK/Native Instruments with Renaat Vanpapeliere (R&S Records); BBC Radio 1 Newsbeat live broadcast, Ultra Records/WDM/Changing Faces live radio broadcast.